iMphiti Lodge is surrounded by lush vegetation, with a quaint stream that flows through the bottom of the garden attracting an abundance of Selborne Golf Estate’s small wildlife and is an ideal vacation home for nature lovers. This beautiful 3 bedroom, self-catering villa guesthouse offers guests peace and privacy with the assurance of safety in this secure Estate. 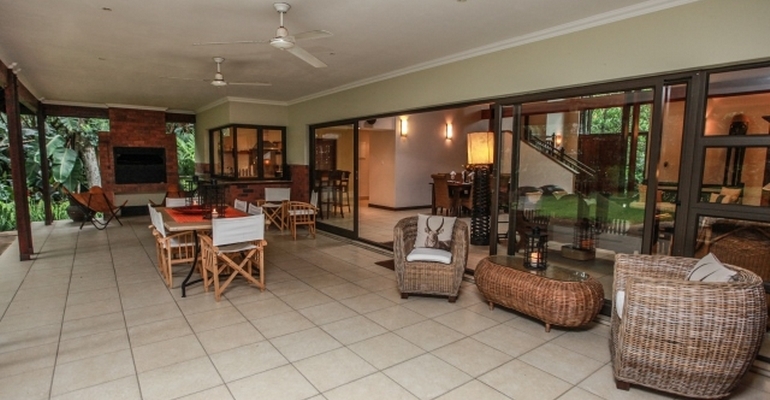 The front of the house has a large undercover veranda with a built-in barbeque / braai right next to the kitchen for easy outdoor catering. Furnished with outdoor dining suite and lounges, the veranda is right next to a gorgeous plunge rock pool for those hot south-coast days creating a tranquil ambiance. An open-plan lounge is stylishly furnished in an antique style with a 6 seater lounge suite and TV cabinet with flat screen Television. Full DSTV ensures that guests will never miss out on those important sporting events or favourite shows. A smaller dining area has a 6 seater dining room table and the fully equipped kitchen makes self-catering a pleasure. Kitchen facilities include: cutlery, crockery, kettle, toaster, microwave, stove, oven, fridge / freezer, dishwasher and washing machine. An expansive main bedroom, situated upstairs, features its own “Juliet” balcony which overlooks the garden area. This bedroom is en-suite with an elegant stand-alone bath tub and large shower. The two guest bedrooms are situated downstairs and are each en-suite. The first has twin beds and the second a double bed and leads out to the garden area & rock pool.